WELCOME to the Tinnitus and Hyperacusis Therapy Specialist Clinic webpage. This service is dedicated to helping those experiencing tinnitus and/or hyperacusis related distress. The clinic currently runs from Monday to Friday, 9AM-5PM at Royal Surrey County Hospital and every Monday, 9AM-5PM at Ashford Hospital. THTSC offers audiologist-delivered cognitive behavioural therapy (CBT) for tinnitus and/or hyperacusis management for adults and children experiencing tinnitus and/or hyperacusis related distress. This is not a diagnostic service and referrals for therapy are accepted from GPs, ENTs, audio-vestibular physicians, neurologists, psychiatrists, mental health professionals, speech and language therapists, audiologists, paediatricians, occupational therapists and other relevant sources. Although there is no definitive cure for tinnitus and/or hyperacusis, people often benefit from CBT and cope well with their symptoms. All members of the THTSC are committed to providing the best possible care for patients. Dr.Hashir Aazh is the THTSC team-leader and has extensive clinical and research experience in the field of therapy for adults and children with tinnitus and/or hyperacusis. All members of the THTC are qualified audiologists who have undertaken specialist training in providing various therapeutic techniques in order to facilitate effective management of tinnitus and hyperacusis. A recent service evaluation survey conducted at THTSC assessed patient’s views about the effectiveness of audiologist-delivered CBT for management of tinnitus and hyperacusis. Of 75 patients who received audiologist-delivered CBT as a part of their tinnitus and/or hyperacusis rehabilitation, 56% ranked its effectiveness as 5/5 (where 1 is no effect and 5 is very effective) and 29% ranked it as 4/5. 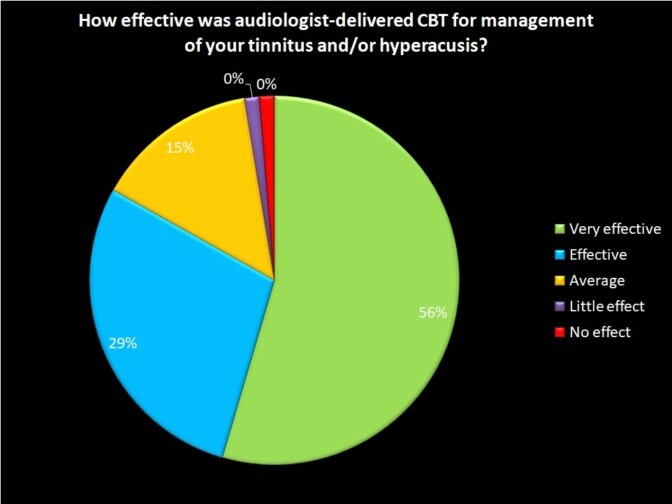 Patients’ feedback about audiologist-delivered CBT did not differ significantly between patients with tinnitus only and those with hyperacusis (with or without tinnitus). For more detail about the outcome of the survey click here. THTSC has strong links with consultants and specialists in other departments within the Royal Surrey County hospital (RSCH). This ensures efficient and fast forward referrals (when required) to Ear, Nose and Throat (ENT), audio-vestibular medicine, neurology, oral and maxillofacial surgery and orthodontics, private hearing aid clinic (HearWear), speech and language therapy, occupational therapy, pain management and other related hospital services. To provide high quality therapy for people experiencing tinnitus and hyperacusis related distress. To ensure an excellent experience for patients referred to us. To conduct research with the aim of exploring effective interventions that can reduce distress in people with tinnitus/hyperacusis.